Director Pascal Bergamin and actor/writer Cavan Clerkin don't mess around. Rather than waiting for film funding that may never have materialised, the duo put together 'Nice Guy', a low-budget London crime drama. 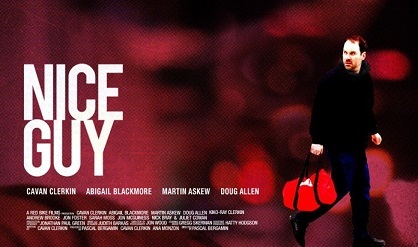 They even managed to persuade the cast and crew to work for free, and while the end result is far from groundbreaking, they should all be proud - 'Nice Guy' is a competent independent thriller. Clerkin stars as David Reighton, father to a young son (Clerkin's own, as it happens) and husband to a disaffected wife, Hanna (Abigail Blackmore). Having lost his job, Reighton stays at home to look after his child, regularly visiting a gentleman's club in the evening to escape the monotony of his life. While he loves his son, Reighton finds solace in the night, enjoying the company of strippers and criminals, a world far removed from his home life. 'Nice Guy' explores a three month period in Reighton's life as he steadily embraces his nightlife, while growing further apart from Hanna. Reighton's evening activities threaten both his own and his family's safety, as he finds himself implicated in a murder - and subsequently, under the power of fearsome gang boss Tommy Evans (Doug Allen). As the situation becomes more fraught, Reighton's desperation manifests itself in a troubling manner. The "wrong man in the wrong place" scenario is one of several clichéd aspects to 'Nice Guy' yet the film largely plays out in a gritty and grounded manner. Clerkin plays his role with a suitably conflicted poise, supported particularly well by Blackmore - the naturalistic interactions between the couple echo the difficulties often faced in long-term relationships. Director Pascal Bergamin brings an impressive intensity to his debut feature film, both in terms of the difficult home life for Reighton and his eventual blitzkrieg. 'Nice Guy' overextends in its final third but the build-up offers an intriguing drama, and moreover, an insight into the darkness that can slowly consume family life - leaving the viewer to ponder just how innocent is Reighton? 'Nice Guy' is available to purchase on DVD or rent from Google Play. Find more info at niceguythemovie.com.